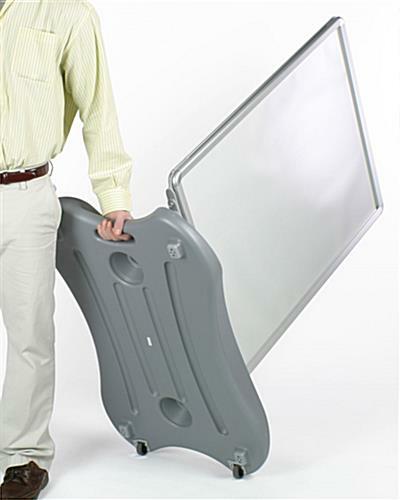 20" x 30" 22" x 28" 23" x 33"
Silver finished aluminum snap frames make it easy to load and unload posters. 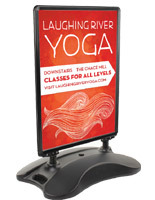 Outdoor signs position your advertising graphics in the most prominent locations, such as outside of a business. Passersby have to pay attention to these pavement boards as they are walking or driving to their destination. 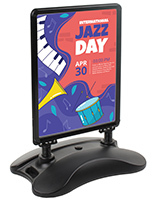 These business signs, outdoor signs include a double-sided 30"w x 40"h poster frame, equipped with snap-open edges for easy graphics updates. 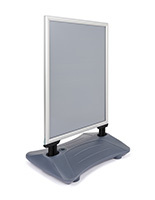 We also provide these pavement boards with non-glare lenses to cover and protect your displayed posters. 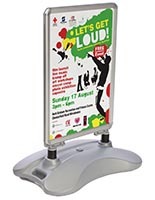 These outdoor signs, also known as outdoor signage holders, feature a water-fill base to increase your presentation's overall stability. A reservoir base can also be filled with sand! For this reason, we recommend using the outdoor signs in high-volume locations. These models work well within a strip mall or on a sidewalk. 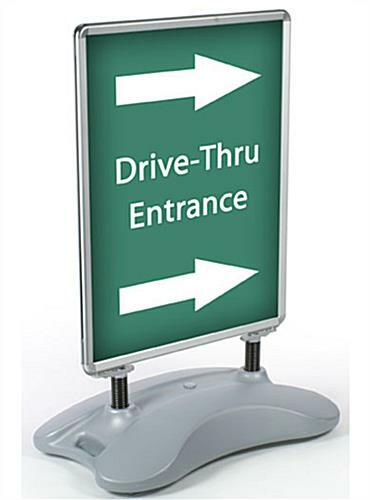 These outdoor signs were made specifically for use outside of a business, retail store or restaurant. Many businesses use these pavement boards to inform passersby about specials and sales. 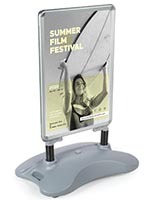 The outdoor signage, outdoor signs utilize springs to attach the aluminum poster frames to the water-fill base. These springs will prevent your business signs from toppling over during high winds or large amounts of traffic. 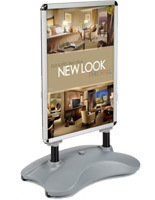 The outdoor signs also include a built-in handle and wheels to help you reposition your business signs with ease. The wheels are great for bringing in the display at night. 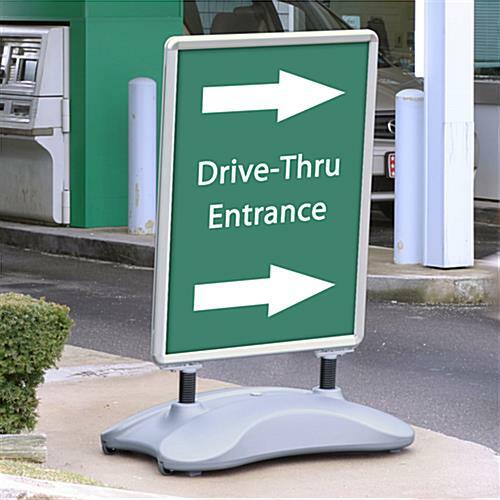 Outdoor signs, such as outdoor signage, will generate even more interest in your business as you will reach new audiences using outdoor signage. 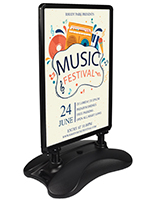 Please Note: While these outdoor signs are designed primarily for use outdoors, they are not intended for use during inclement weather, including heavy rain, snow and high wind conditions. These outdoor signs are not "seal-tight" and therefore water can seep in under the lens, potentially affecting signage in the frame. We always recommend bringing these business signs inside during such conditions, as well as overnight. 41.0" x 56.0" x 25.0"
41.0" x 7.0" x 25.0"
Great sign, but reoordering parts is complicated!!! When the wheels of our first sign were stolen, we were told that there are no replacement wheels for it. Without wheels we couldn't use the sign anymore and had to throw it out. The second signs plastic covers were slightly too large and therefore it got ripped in a storm. Their machine for reordering the poster plastic cover is broken and they recommend to go and buy it at Home Depot and have them cut a plastic to the correct size. It will be weeks until they fix their own machine. We are very sorry that we were not able to accommodate your request for replacement parts at this time, Julie. A customer service representative will reach out to you shortly to see if there is anything else we can do. Hi Jodi, We are sorry to hear about your sidewalk sign. We will have a customer care specialist reach out to you. 5 Stars now! My original review was just 1 star because the PVC covers warped and came out. Without that, the sign is useless. 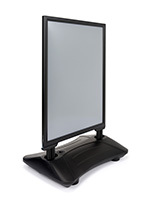 But a Displays2Go rep contacted me and told me I could buy a set of a replacements. I received the new inserts and the sign is working great again. Posted 2 years ago by Jodi H.